For my Birthday Celebrations go Here. You have until Monday 12/3/2012 to sign up. For the Raisin Boat Challenge go Here. You have until 12/12/2012 to add a project to the challenge. 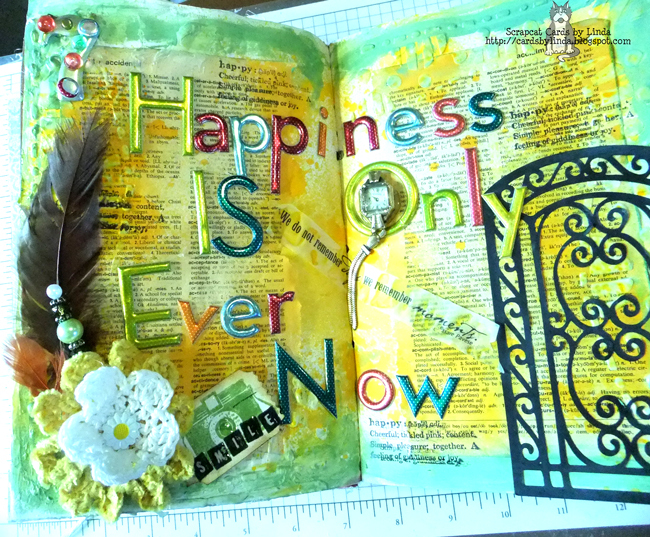 Today I have a page from my Happiness Journal to share. I am following Marianne from Poketfullofvintage. Here is Marianne's Video for #7. This is a wonderful project and I am really enjoying working in this journal. Lots of great techniques and bright happy colors on this art journal spread. Well done! It's almost our big days!! I loveeeeeeeeeeeee your journal page!!! LOVING the colors, the feather and that title!!! Linda this is fantastic - love the bright colours - a very "happy" page! !